...ideally with a fold down Manga Screen fitted on top, ready for Intel's big event Geek So In #10 on December 8. I was inclined to oblige, since they are so heavily invested in open source and trying really hard to make their way on to the maker scene with their Edison, Arduino 101. the Intel NUC might also be an effort towards that, having the pay-off "what will you make?" on the side of the box. I mounted a Manga Screen on there. Added a couple of hinges as well, so it folded down for easy transport. If you want to do this, make sure you connect to the internet after starting up, so Windows 10 can do an update and get the timings for the right resolution. Apparently, making this work with the native 800x480 @ 60 Hz does not work out of the box. So compared to Raspberry Pi and BeagleBone Black etc. this one has a lot of power. Very nice if you just want to make something like a DIY like/dislike button for your company as the customers are leaving your store, a quick and easy internet radio so your kids can listen without having the Internet, the base for a home automation system, you name it. It is about ten times the price of a Raspberry Pi, but the use cases are different. The thing is, with the replaceable lid it's easy to 3D print something that actually looks good and yet is customized for your application. 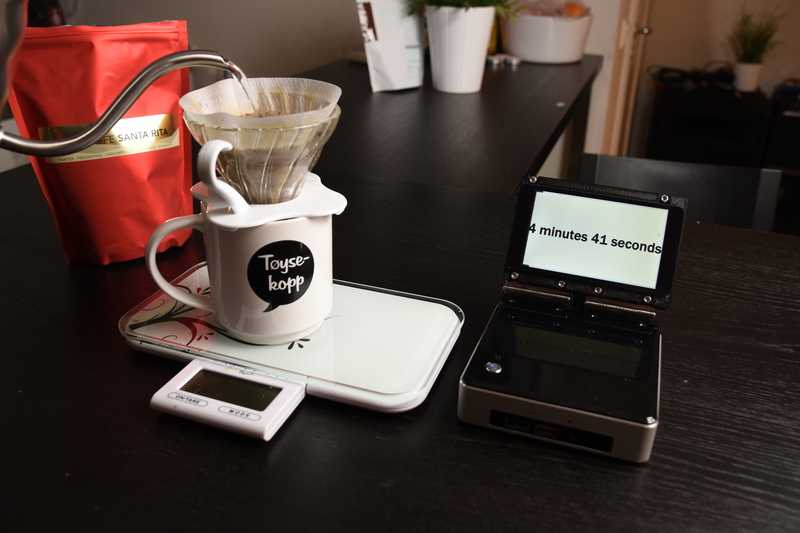 I using it for timing my coffee brew, that worked!